I'm one of those people who thinks that food is even tastier when it's cute. Yes, I like tea sandwiches, and there is no reason to like butter and cucumber on white bread. But it's CUTE!! 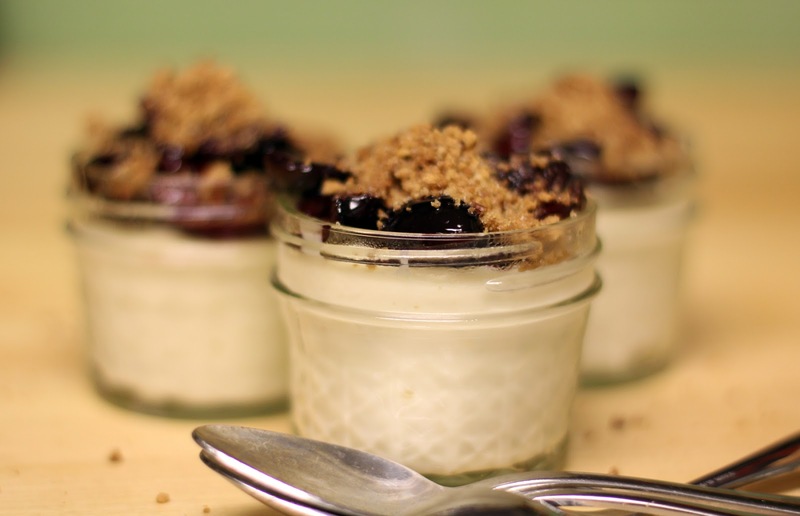 I saw these cheesecakes in jam jars in the Oregonian a few weeks ago and knew I had to make them. The cheesecake batter is very easy, and these tiny bites of cheesecake bake up in 25 minutes. These don't use a crust, so I also made the crumbly, graham cracker crust topping to sprinkle on top. And since cherries are in season, I a cooked up about a cup of pitted cherries with a tablespoon of sugar. Mighty tasty! 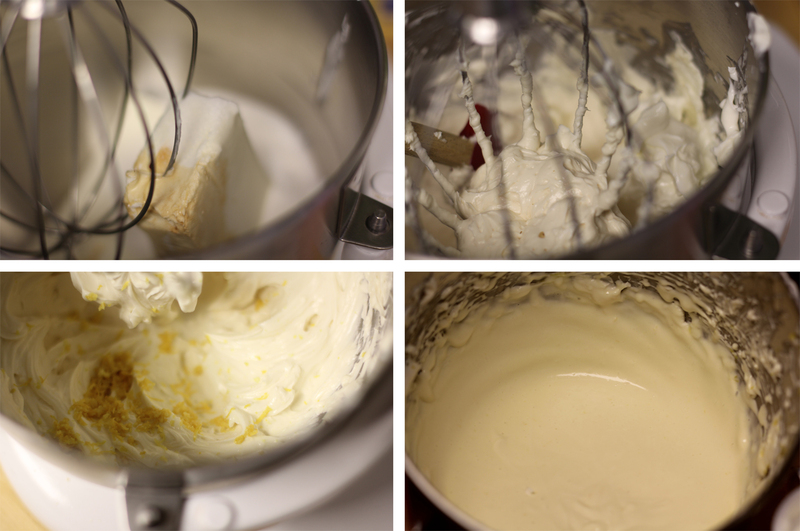 In a stand mixer fitted with the whipping whisk, mix the cream cheese, sugar and vanilla until light and fluffy - about 6 minutes. Next, beat in the sour cream until thoroughly mixed, about 1 minute. 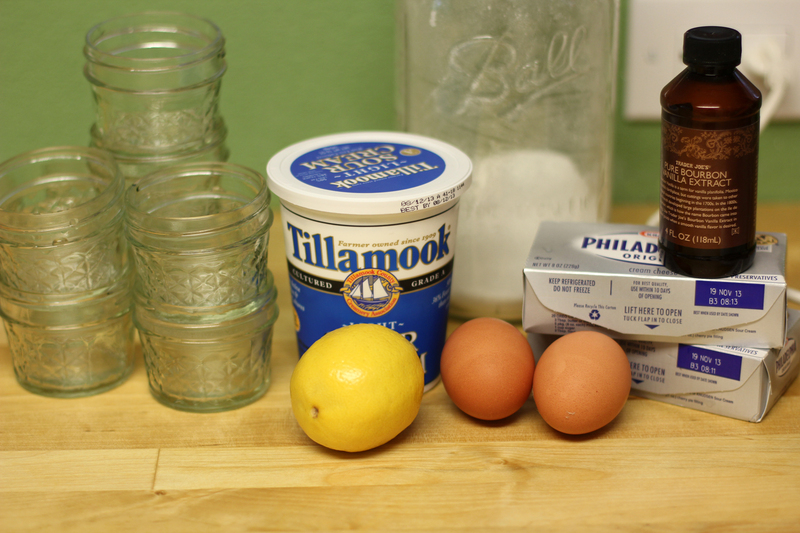 Add in eggs one at a time and beat until just incorporated, about 20 seconds. Scrape down the sides of the bowl and last beat in the lemon zest until just mixed in. Fill 10 jars leaving about 1/2 of space at the top. Place jars in a 9x13 inch baking dish and pour in enough hot water (hot from the tap, no need to boil or heat on the stove) until the water reaches about half way up the jars. I had some cherries that I was planning on using for the topping, but on a whim, I decided to chop some up and put them in the bottom of the jars. The middle picture shows this. When we try these, I'll let you know how the turned out. Right now they are kicking it in the freezer waiting until we come back from a bathing-suit-rich vacation! In a food processor, blend graham crackers, sugar, cinnamon and pecans. Once crumbly add in the melted butter and pulse until incorporated. Spread the crumbles on a sheet of parchment paper on a rimmed baking dish and bake for 10 minutes. Next time, I will cut this recipe into thirds. 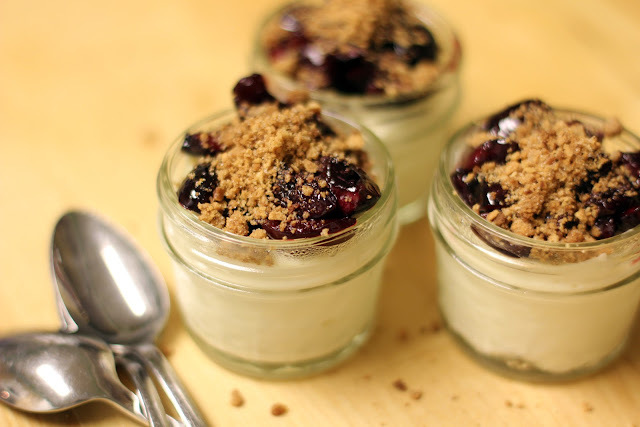 It was way too much crumbles, even as yummy as they are. I added a bit more lemon zest than the recipe called for, and these had a nice little tang to them, but I like a little bit of tang in cheesecake. This batter and the crumb topping are nearly identical to the cheesecake tart I made last summer. Both are really easy and lemony. I made cherry topping this time, but strawberries, blueberries, or chocolate sauce would be delicious too.